I’m so excited about my new crochet colors! I’ve been so slacking with the 2016 Block-a-Month Crochet-Along. I’m usually checking Ravelry on the very first day of each month and excited to make the selections, but for the past few months I’ve been feeling really uninspired. I had chosen my original colors at the beginning of the year, looking for a nice blanket to have at Christmastime for my new MIL, but the color combination, while beautiful, just wasn’t speaking to me. So this month, in the middle of the year, I decided to start working with a whole new color scheme. 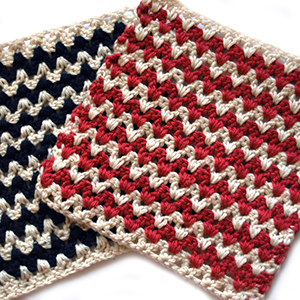 And I whipped up all three squares in my new crochet colors in just as many days. Funny how color has so much influence over little things, doesn’t it? I kept with the same yarn that I’ve always used for the bamcals, which is Caron Simply Soft. I went through my board of color schemes on Pinterest and found a handful that I liked, and then narrowed it down from there to this color card from this website (in Russian). I don’t usually use black as often as I’d like to, and the contrast between the flowery, analogous colors and the black intrigued me. So I went about collecting my own version of the inspiration card into the following colors: black, harvest red, strawberry, melon and lemonade. I added off-white as a second contrast color as well. I’m really happy with the way these turned out. I didn’t use all the colors in the Picturesque square, and I think I kind of like that – rather than giving each square a sampling of each color, I’ll let the end result pull colors out from each other. Usually I only do that with my 6″ squares (though in the four that I make, I use them all). Anyway, it will be exciting to see how it turns out at the end of the year. This was the filler option for the bamcal, but I utilized all the colors in my scheme in this square, so I thought I’d share it first. The pattern is Victor, by Polly Plum. I have to insert here how much I love all of Polly Plum’s designs, and if you’re willing to spend a little bit of money on a quality product, check out her beautiful selection of crochet blocks. As of right now, however, this square is offered free on her blog here. This was sort of my testing square, seeing how the colors worked together, how to arrange them so that they contrasted well. I can’t photograph the color red to save my life, apparently, and I could have used a little less pink, but overall it seemed like a good starting off point for the new crochet colors. Melinda Miller is another great crochet designer, in my opinion, because her patterns are easy to make, but have stunning outcomes. This one was no exception. Picturesque has a fabulous center motif that is beautiful on its own, but is even more lovely in the square setting. This is where I fell in love with my crochet colors. The elimination of the pink and yellow left a striking black and white theme that is offset by the red and the melon. I think these will be the main colors I work with for the rest of the year, leaving the other two as smaller accents only. This square is available as a free Ravelry download here. And if you Melinda Miller’s patterns, she also has a Ravelry group where you can be updated on the latest ones coming out, as well as the crochet-alongs that she hosts fairly often. 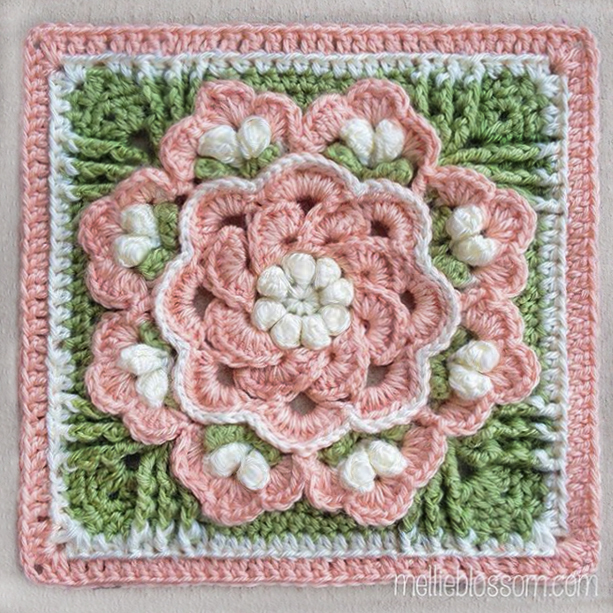 And finally, the 6″ square for the May 2016 bamcal is the Gothic crochet square. I enjoyed sampling out the colors with the black (stained glass-looking) outline designed by the pattern and seeing how the different color combinations worked together. While I think I’ll still stay with the main four I outlined above, it was good to see the other two colors in relationship to the overall scheme. You can find this pattern here in the archives of the internet for free. We’ll see how things go for the June squares, but I’m pleased with my new crochet colors and I’m hoping I’ll stay just as inspired for the rest of the year.